GURPS often treats spells as skills, balancing stronger magic not with point costs but by requiring more time, risk, energy, or all three. Yet wizards in some settings can conduct rituals – even powerful ones – quickly, safely, and repeatedly. These magic-users wield a kind of innate magic known as sorcery. Nearly 50 ready-to-use spells – inspired by GURPS Magic but built using advantages – with guidelines for creating more. Augment Sorcery with the defensive and forewarning spells found within GURPS Sorcery: Protection and Warning Spells. 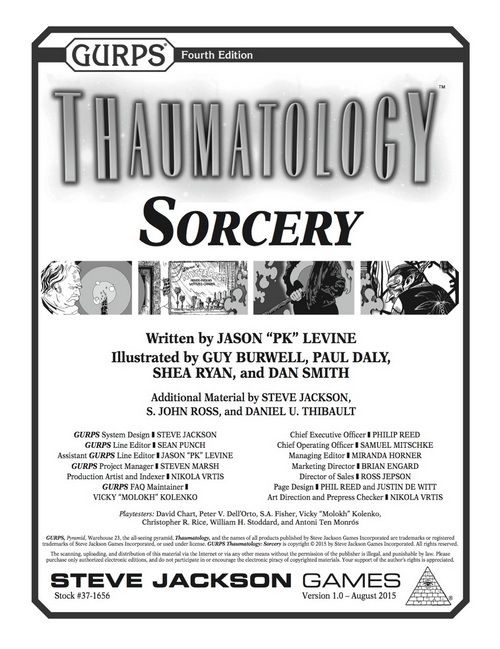 For more options and insight into other magic systems, check out the core GURPS Thaumatology book. 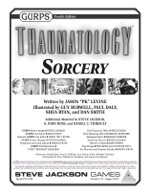 Do you want to use sorcery in a GURPS Dungeon Fantasy campaign? You can, with the optional lens and rules from Pyramid #3/82: Magical Creations! Discover how to use the Sorcery system to be a super-hero, with Pyramid #3/105: Cinematic Magic.